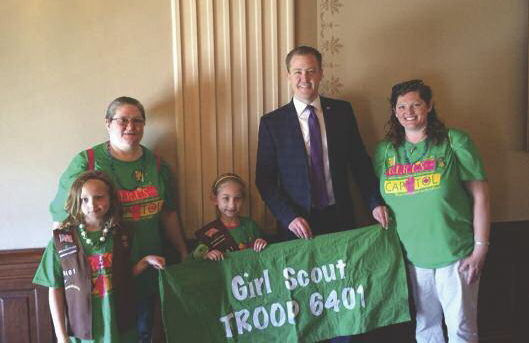 Winchester Girl Scout Troop 6401 had the honor of being recognized by State Representative C.D. Davidsmeyer during session at the State Capitol in Springfield during Girl Scout Day at the Capitol on Friday, April 27. Pictured in photo are: (front, left to right) Isabella Borgens and Brylee Vestel; (back, left to right) Kati Borgens, C.D. Davidsmeyer and Carolyn McGee.